What do you dress up as when you're already a superhero or a giant fuzzy monster? How about a crew of box office-busting superpowered movie stars? 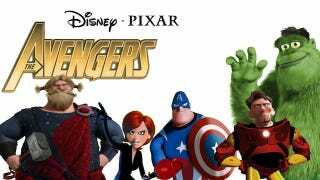 See several Pixar characters recast as members of the Avengers. Artist JM Walter created this mashup piece. Nice to see that Brave's Lord MacGuffin has already made it into the fanart mix. Tony Stark is actually a double cosplay: young Charles Muntz's head on Buzz Lightyear's body. Given that Pixar's characters and Marvel's are under the Disney umbrella, how long before Pixar/Marvel merchandise turns up in stores?